Was craving a "simple" strawberry and cream vape and found this, really glad I did. Fuji gives it a nice twist, dropped it down to .5 as suggested below. Really good straight forward S&C vape that I could vape all day. 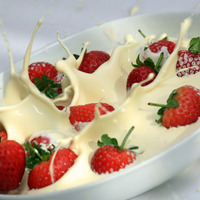 The cream are smooth and nice, the strawberry bold and in the front. I really enjoy this. The cream is mild and clean. The strawberry is tart and dominant. As a shake and vape the apple was a little too distracting for me. After a 2 week steep it has calmed down and I enjoy it much more. Next time I mix this, which will be soon, I'll likely drop Fuji to 0.5%. That's just personal preference. The recipe is fantastic as it is. The complexity of the strawberry is intriguing, and I find myself taking 5 or 6 draws to get a good sense of it. That's the mark of a great recipe!